The big challenge today was *trying* to do justice to two national parks while getting through them in a timely manner. Of course, this endeavor was not helped by my late start. 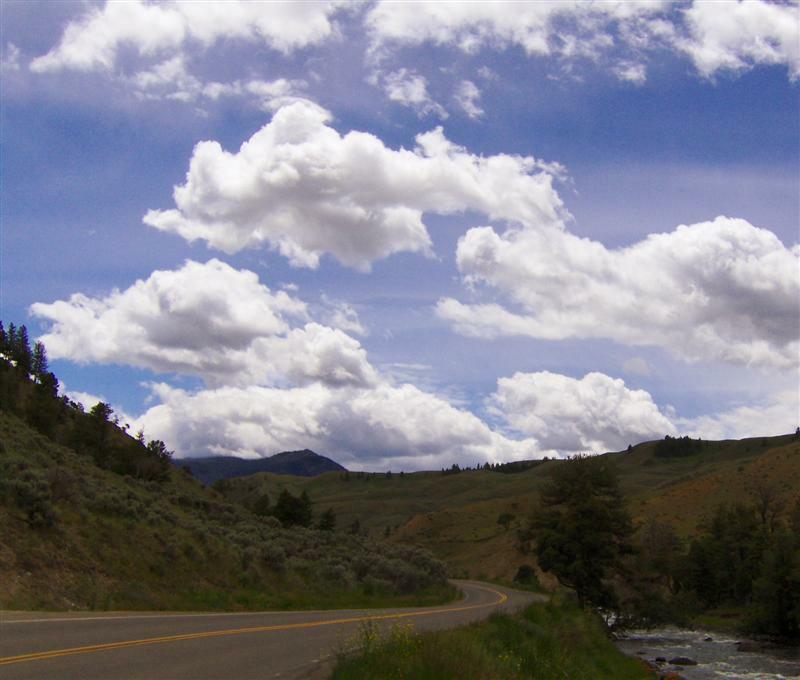 The first order of business was to head south on US89. 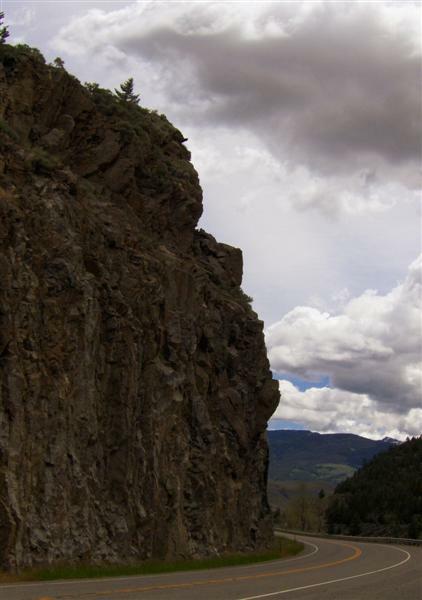 Interestingly, this road (the only access road open year round) parallels several historic roads and rails into Yellowstone. 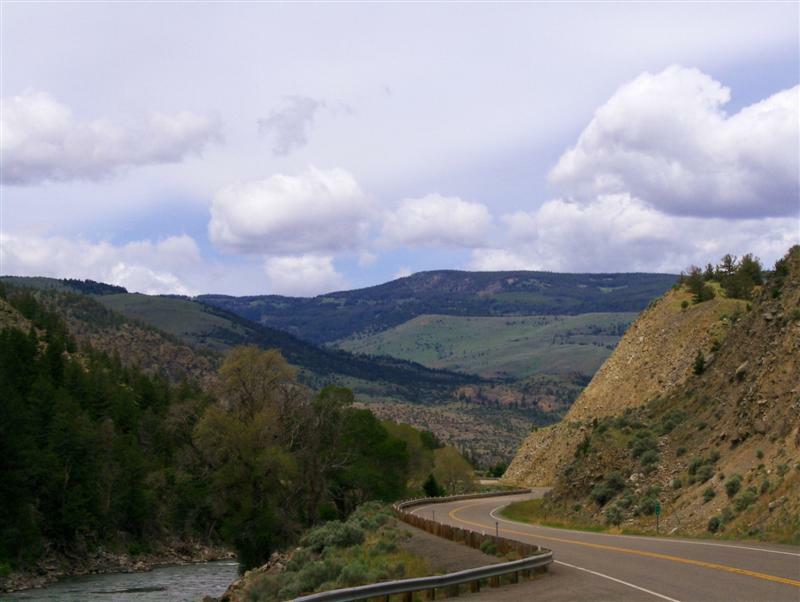 In several places along the route, cuts can be seen in the hillside both above the current road and in the cliffs across the Yellowstone River. 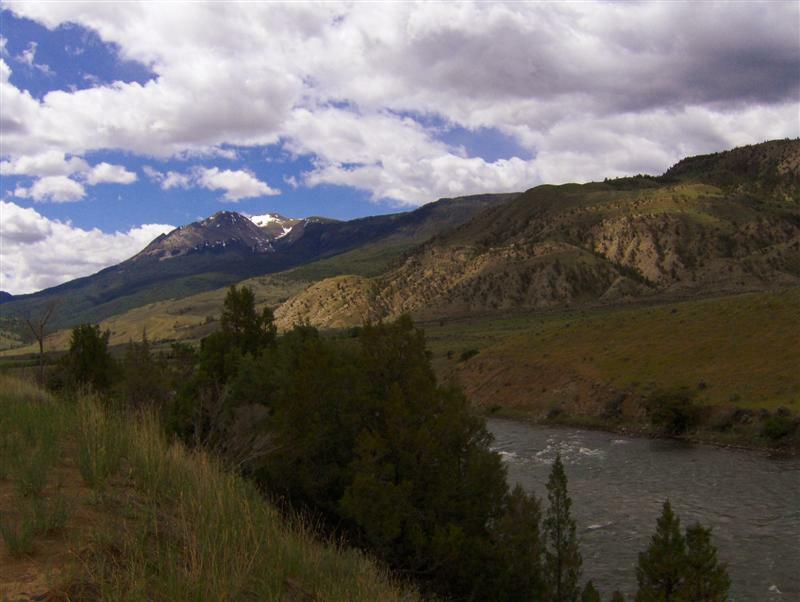 Just before entering Gardiner, MT, I stopped at a turnout to read about the preservation of Yellowstone’s winter range, where 10,000 elk, bison, and other animals migrate each winter in search of milder climate and grazing area. The northern entrance to the park is historically the most popular. In the early years, before good roads, it was very difficult to get to the park. 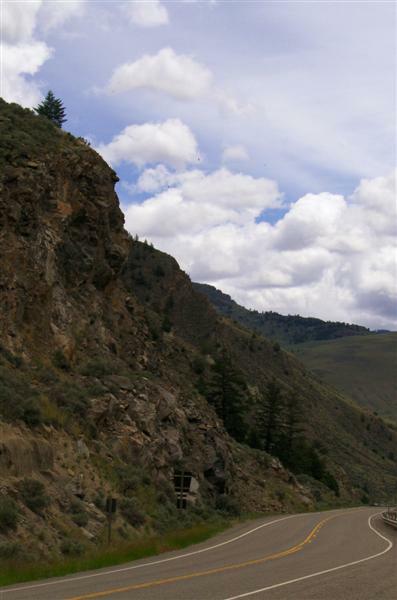 Visitors increased dramatically in 1903 when a railroad line was completed to Gardiner. 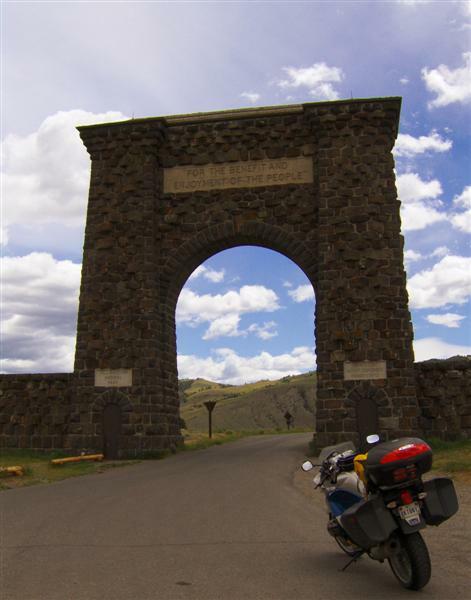 That same year, the “Roosevelt Arch” marking the north entrance was completed and dedicated by visiting President Theodore Roosevelt. Of course, the NPS sign was just behind the arch. I had to wait in line for my pictures yet again. And with a flash of my National Parks Pass, I was inside the park. It was already noon and I had a long way to go, especially with 45 mph speed limits and frequent stopping. The time constraints weren’t worrying me hugely. I did not have any plans to do any hiking or sightseeing other than that possible from very close to the road. 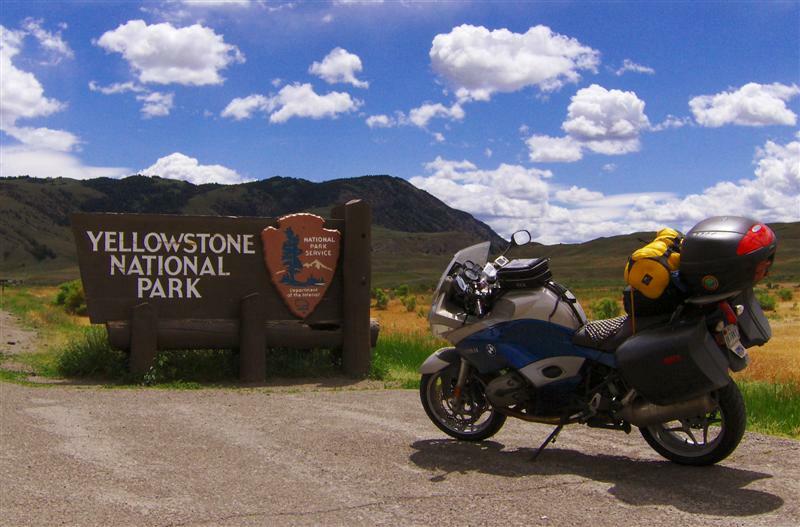 I’ve been to Yellowstone several times in my life. I’m not exactly sure how many times because my memories of visiting the park go back to my youth. 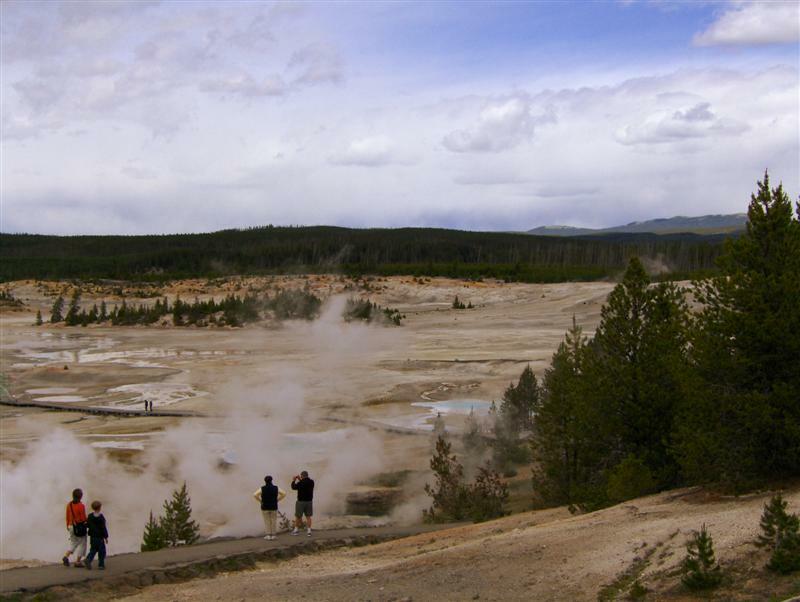 At some point in my visits, I’ve walked all of the major geyser basins, some many times. I remember what it was like before the fires of 1988 (in fact, I was in the park only a few weeks before the fires started). I’ve stayed in the lodges, licked ice cream cones while waiting for Old Faithful, screamed at the sight of large insects, and watched bison walk through the parking lots in the morning. Just driving past places brings back memories. 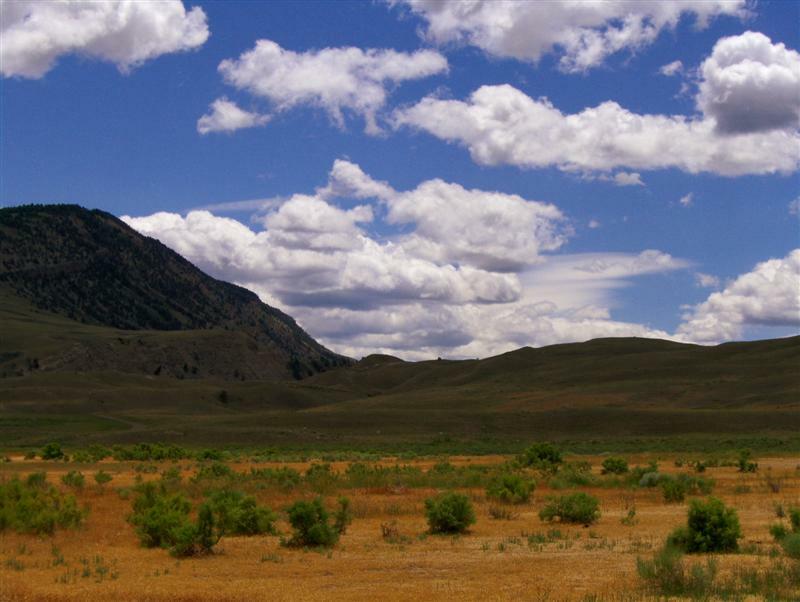 For example, passing “Artist Paint Pots” instantly brought back memories of the sights, sounds, and smells of walking through those particular hot springs with my cousins. Driving past a picnic grove brought memories of finishing a cold-cuts lunch before grabbing toy animals to play make-believe with around the creek. So really, just being in the park was a walk down memory lane… a cascade of experiences past in only a few hours of riding through. 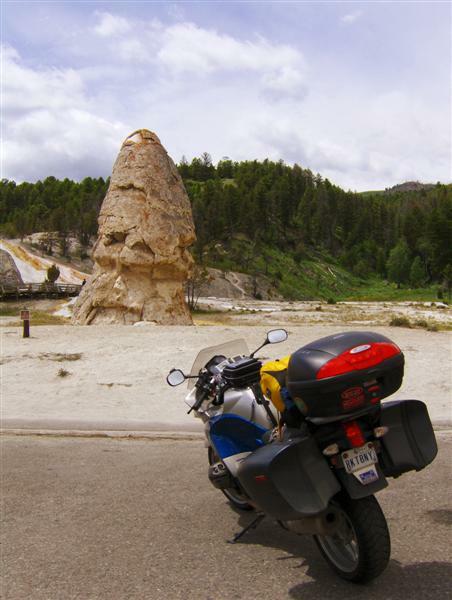 I started with Mammoth Hot Springs. The town looked just as I remembered. We stayed there many times. 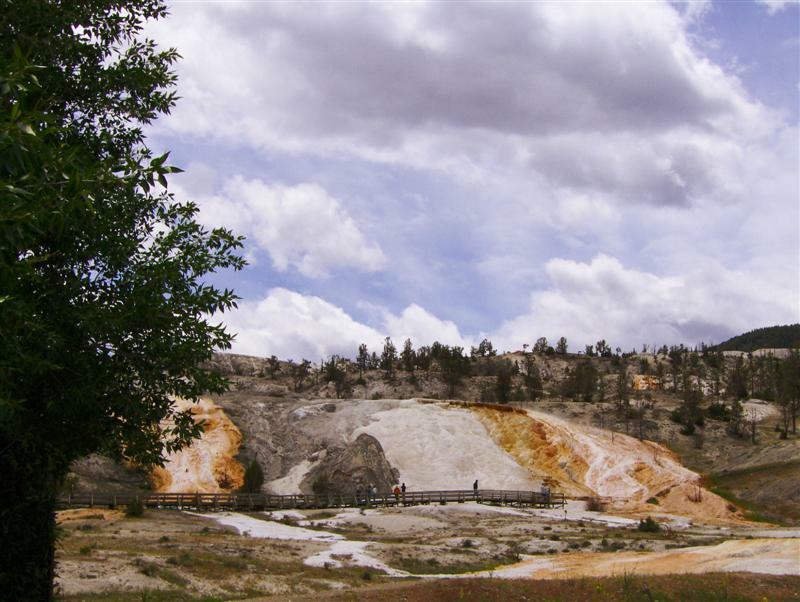 I think the colorful terraces there are my favorite springs in all of Yellowstone. I got my only wildlife shot of the day while riding through a parking lot trying to get a better view of the terraces. This elk was on her way to graze on a lawn. 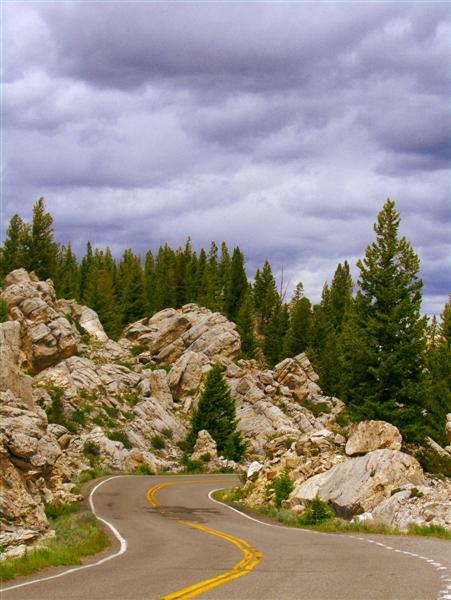 The amount of fun to be had on the slow winding roads heading south from Mammoth was amazing. Several Rvs pulled over for me, and many turns were tight enough that I wasn’t exceeding the speed limit. Much. When I came through the park two years ago, one of my major disappointments was the lack of activity at Echinus Geyser. I have fond memories of spending hours sitting around the geyser watching it fill, erupt, and empty before repeating the cycle. 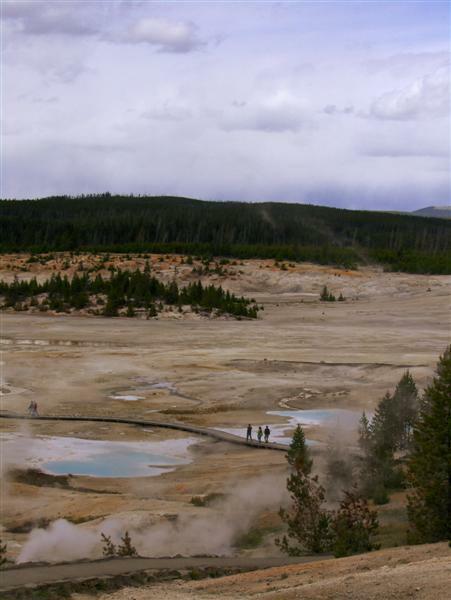 Back in 2005 I brought a book and sat around the geyser for two hours while absolutely nothing happened. While on a “Happy Fathers Day” call with Dad last night, he suggested that I ask a ranger about the status of Echinus. I parked at Norris Geyser Basin with that intention. The ranger sadly told me that Echinus no longer erupts regularly. Once every few weeks is more likely, with the last eruption noticed by a passing visitor a few days prior. I walked over to the Porcelain Basin overlook to take in the view before continuing through the park, Echinus unvisited. 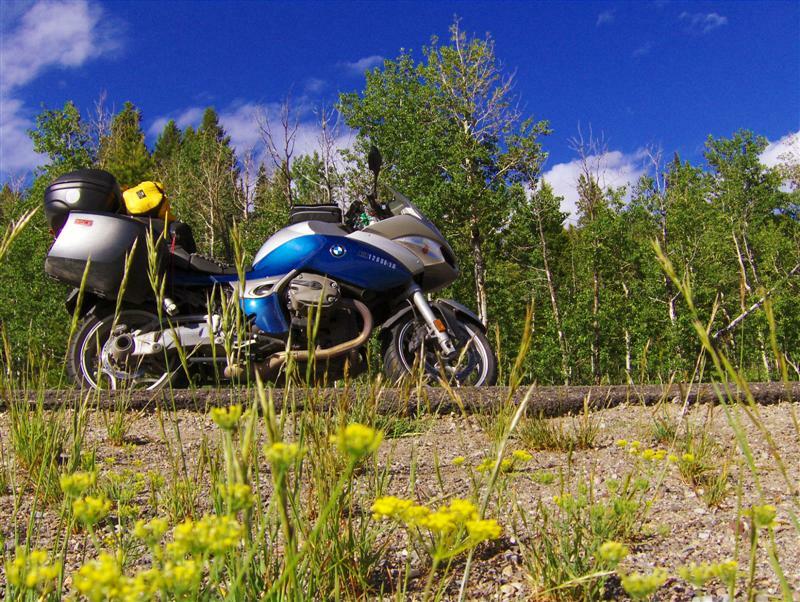 I saw some wildlife on the way between Norris Basin and Old Faithful. In each case, there was a lack of paved turnouts and too much traffic to stop and get my camera out. While elk were plentiful, I saw only one bison. I guess next time I should plan to drive through Hayden Valley on the eastern side of the park. I did not stick around for an Old Faithful eruption. The interval is now around 90 minutes and I felt like I’d seen enough of them in my life to not be missing much. 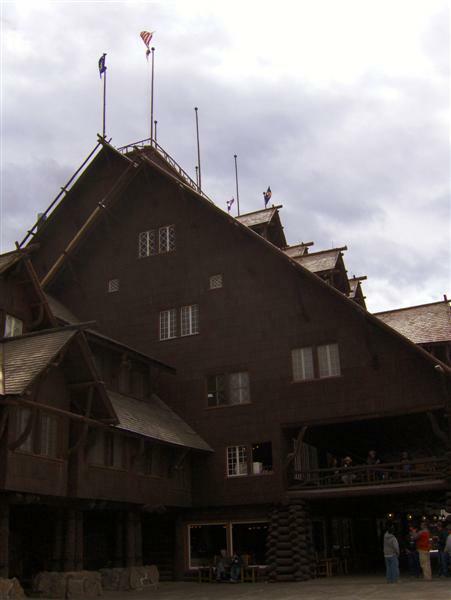 The historic Inn at Old Faithful is still under construction, but I was able to walk inside while looking for stickers at the gift shop. (I’ve been stickerfying my top case with national park stickers). 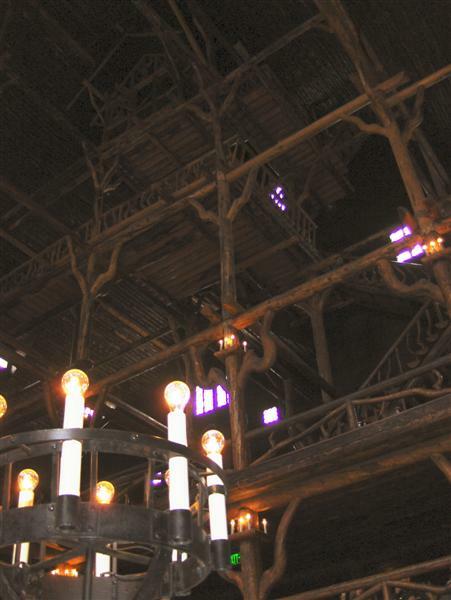 I love looking up to see the rough timbers that hold the dizzyingly high roof. 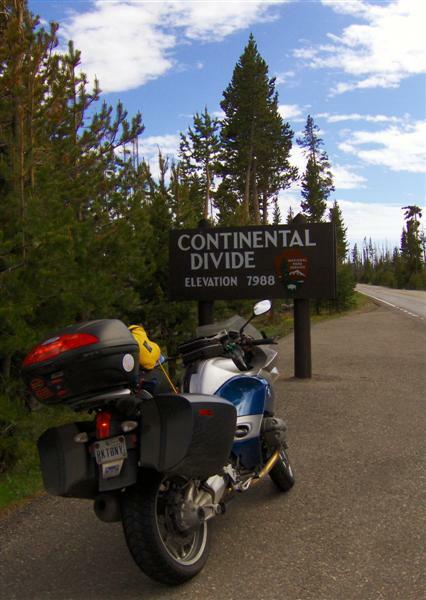 Heading south, I crossed the Continental Divide several times. This was not the highest elevation crossing, but it’s the only one I stopped at. 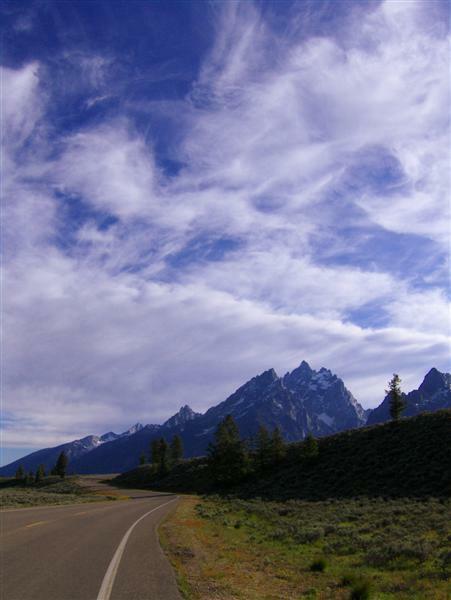 The sun was getting low in the sky as I entered Grand Teton National Park. Riding alongside Lake Jackson, I marveled at the jagged snow-covered peaks to the west. 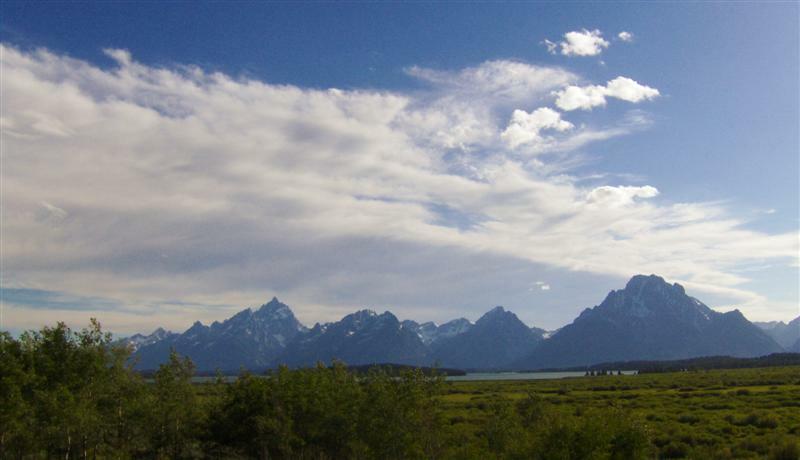 The Teton range was formed when two fault blocks slipped vertically. 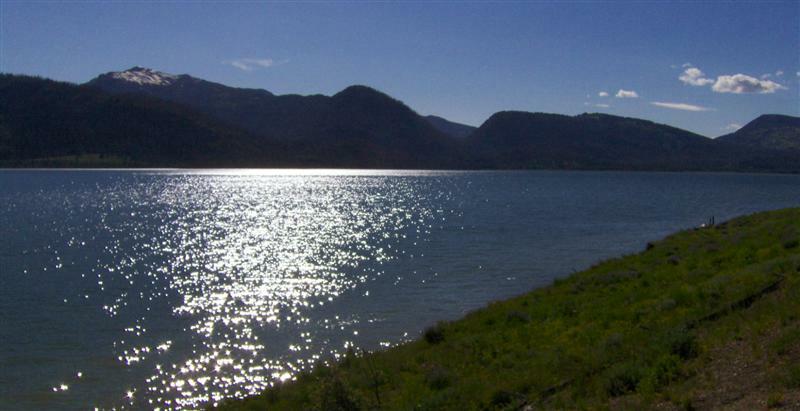 Lake Jackson sits in the pit of the lower fault block while the mountains are the remains of the higher block. 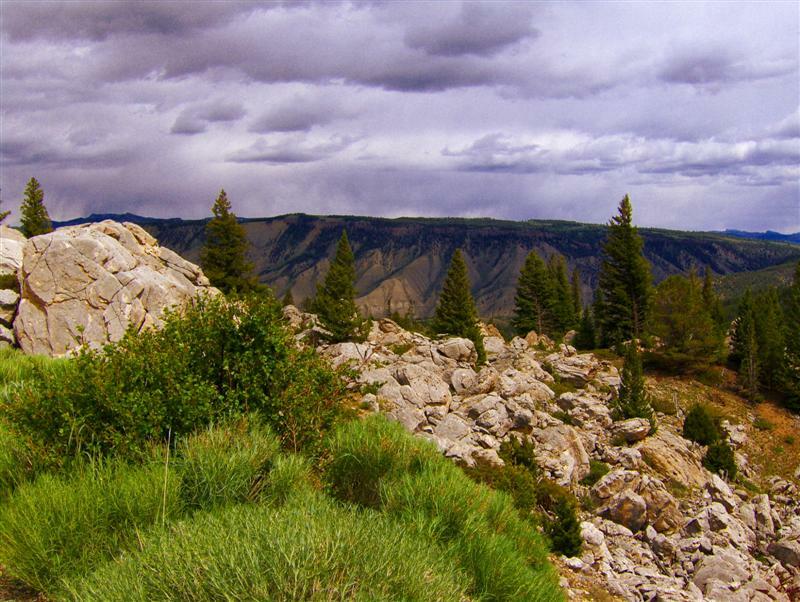 Grand Teton, the highest peak in the range, is almost 14,000 feet high. Several peaks in the range top 12,000 feet. I looked down at the GPS in horror as I left the park. It told me that I would get to my intended destination (Rock Springs, WY) after 11pm. 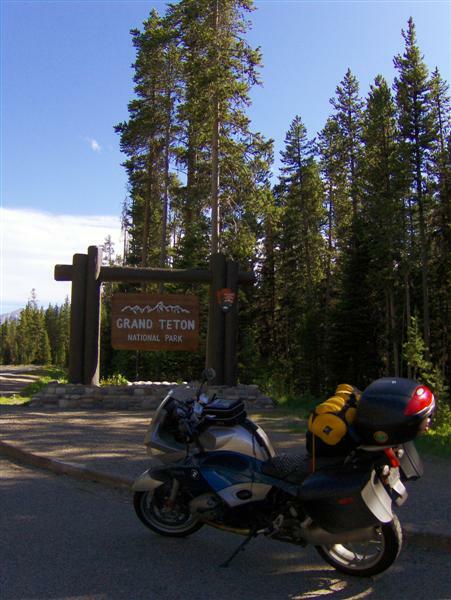 Thinking that it was a supremely bad idea to ride in wildlife-infested Wyoming in the dark, I decided to ride to the next major town past Jackson (a freakishly overpriced tourist town). 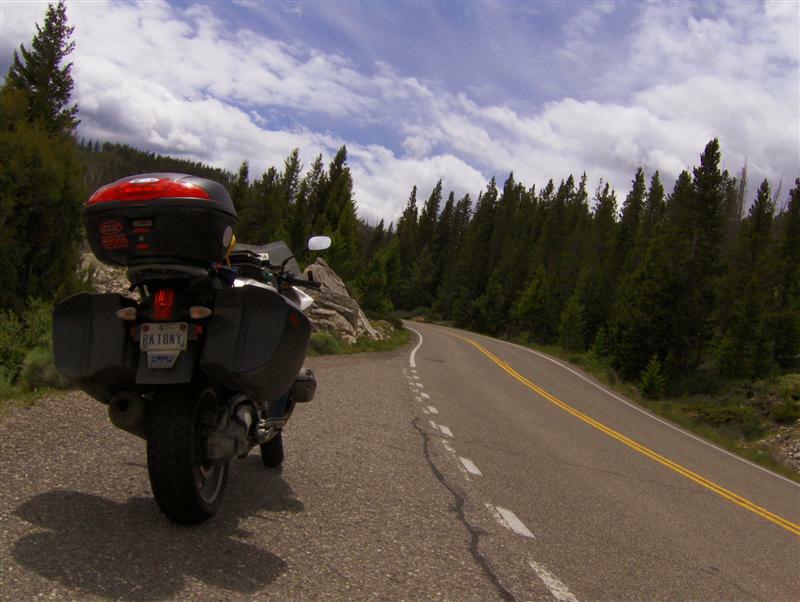 Pinedale, WY at 100 miles north of Rock Springs was the winner. I found a motel and vowed to get an early start to make up the 100 miles that had been added to my next day’s route.